For the home computer versions, see Golden Axe (home computers). For the free Android and iOS versions, see Golden Axe (Sega Forever). Golden Axe (ゴールデンアックス) is a beat-'em-up developed by Sega and released in 1989 for Sega System 16 arcade hardware. The development team was headded by Makoto Uchida, who also led the team behind Altered Beast. The game was the first in the long-running Golden Axe series. It is said to be heavily inspired by the Conan the Barbarian films, and that the game took roughly one year to make. The game also "borrows" voice data from said movie and other Hollywood blockbusters. The game takes place in the fictional land of Yuria, in which an evil entity known as Death Adder has kidnapped Yuria's King and his daughter, holding them captive in his castle. Perhaps more importantly, Death Adder has stolen the "Golden Axe", a magical emblem of Yuria, and is threatening to destroy it if the people of the land do not accept him as their ruler. It is up to a band of three heroes to venture to Death Adder's castle and stop him, rescuing the captives, avenge their losses and save the land: Ax Battler, Tyris Flare and Gilius Thunderhead. Golden Axe supports a maximum of two players. Any character can be selected but both players cannot play as the same character. The Golden Axe arcade cabinet assigns one button for attacking, another for jumping and a final button for using magic. Using magic will cause all of the enemies on screen to be damaged and effectively acts as crowd control. Each player carries a limited supply of magic (indicated by a meter at the top of the screen) and will use it all at once when the magic button is pressed. Some magic can also re-kill already defeated enemies, adding extra score. This bug is only present in the arcade version. More magic can be collected by attacking the short thieves clothed in blue who appear at certain points throughout the game. Green thieves carry life energy, also represented in the HUD. Golden Axe is also notable for its ability to allow players to ride "beasts", often giving them an offensive advantage at the expense of speed. Similar to Altered Beast, the ending is less serious and has characters from the game breaking out of the arcade machine and causing havoc in the real world. Most ports replace this ending. Ax Battler is a male barbarian fighting to avenge the murder of his mother. Despite his name he uses a two handed broadsword and carries earth magic. Ax Battler is one of the constants of the series, appearing in most Golden Axe games (including Ax Battler: A Legend of Golden Axe, a game based entirely around him). Gilius Thunderhead is a dwarf whose brother was murdered by Death Adder. Gilius is the only character to actually carry an axe, as well as thunder magic. Tyris Flare is an amazonian woman whose parents were killed by Death Adder. She also uses a sword but carries fire magic. The Mega Drive version of the game adds three more levels. This is the first, which is part of stage 5 in the arcade version. Also a Mega Drive exclusive. Golden Axe has been ported to a number of systems over the years, though many cuts were made in the process. The game has enjoyed many years of success on the Sega Mega Drive, and was used in the early days of the console to advertise the system's power over its then-main rival, the Nintendo Entertainment System. Some levels were shortened, but an extra level was added which includes another boss, "Death Bringer", a recolored version of Death Adder. Also in this version is a "duel" mode, which allows players to fight a succession of enemies one-on-one, 12 rounds. "Beginner" is another new mode, allowing you to play the first three stages with easier enemies. A single use of magic takes away only two magic pots and you fight "Death Adder Jr" as the last boss. This game saw a software revision. The original release had a graphical bug after defeating the final boss: his axe, while spinning around in the air, displays as garbage graphic data. Much of the text was also slightly rewritten to make more grammatical sense. The Mega Drive version of the game has been included in numerous compilations, such as 6-Pak, Mega Games 2, Mega Games 6 and Mega Games 10. The game has also been emulated and sold in the form of Sega Smash Pack Volume 1, Sega Smash Pack, Sega Mega Drive Ultimate Collection, Sega Archives from USA Vol. 1 and Sega Mega Drive Classic Collection Volume 1, as well as services such as PlaySega and built-in to numerous consoles by AtGames. This version was so popular that it got direct sequels in the form of Golden Axe II and Golden Axe III. In the arcades, the "true" sequel is Golden Axe: The Revenge of Death Adder. A Sega Mega-Tech version also exists, which is based on the Mega Drive version, as is the version released for the Wii's Virtual Console service. The Mega Drive Golden Axe was enhanced for the Sega Mega-CD and delivered as part of Sega Classics Arcade Collection. This version is single-player only, although offers numerous improvements in terms of audio and some graphical tweaks. The Sega Master System version is also one-player only, forcing you to play as Ax Battler (named "Tarik" in this version and presented as a different character story-wise). You can still select one of the magic elements that each of the three original characters had. There is also a NEC PC Engine CD port which takes a big hit in terms of aesthetics, has very poor sound effects and is only single-player. It was also ported to the WonderSwan Color and as part of Sega Smash Pack for the Game Boy Advance. 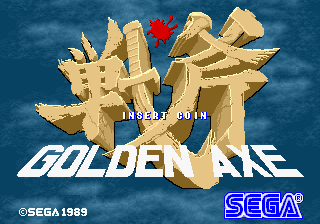 Golden Axe was also remade as part of Sega Ages 2500 Series Vol. 5: Golden Axe, and has been brought to Xbox 360 XBLA, Wii Virtual Console, PlayStation 3 PSN, and is available for iOS and other mobile devices. The iOS version was removed from sale on iTunes in 2015. In August 2017, Golden Axe was added to the Sega Forever collection, bringing it back to iOS and adding a new Android version. Both versions are the Mega Drive game running on emulators. Main article: Golden Axe/Magazine articles. Main article: Golden Axe/Promotional material. NEC Retro has more information related to Golden Axe.